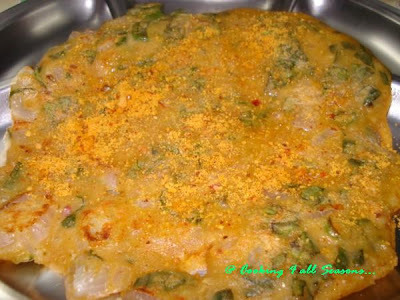 Cooking 4 all Seasons: Spinach Masala Dosa ~ 101 Dosa Varieties! We normally use palak or Spinach as Palak Paneer or mostly make Palak Dal. But when I saw this dosa variety calling for a Palak, I was wishfully wondering if it will be liked. Sometime earlier, Athamma used to grow Palak in our backyard. Whenever we feel we don't know what to prepare, she used to go check out the veins and come back with fresh Spinach leaves. It will then find itself emerging as a Dal. Palak Dal tastes great, it goes well with both Rice and Roti. So I was very apprehensive about masking in a Dosa batter. But I was ready for this, as my experiments with a new dish rarely goes wrong, excepting my flop yesterday. I set out to make Ambur Mutton Biryani but was so disappointed that it didn't come out well. It looked great and all, except it lacked the spice and whatever makes that briyani. I didn't know I will be so affected, but the fact was, I was feeling very low. This is the first time I had a flop at my kitchen. Disappointment leaves a very bad taste behind, I realised. The after effects of that left me drop out couple of other things that I had planned to prepare, the mood wasn't just there. I guess I just have to take flops in my stride. I know I will be making it again and get it right. But its just that I never expected it to go wrong. Anyway coming back to the Spinach Masala Dosa, we found this to be very simple and easy to make. A good one for a easy dinner. I made this for Saturday night and it was perfect. Soak the Raw Rice for 2 hrs. Then roast all the ingredients listed under To be roasted, one by one. Let it cool. Drain the rice and add all the roasted ingredients along with tamarind and jaggary. Grind to a smooth batter using water. The consistency should be of the regular one, like dropping state. Then add the raw ingredients and mix well. Heat a tawa and once its hot, smear oil on top. 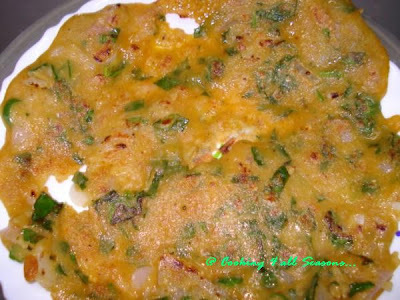 Since the batter has spinach and onions, you will not be able to spread it easily like a regular dosa. So take a ladleful of batter, and drop the batter in a circle and try to make an even spread. Sprinkle oil around the sides. Cover it with a lid and sim for 2 mins. Once the bottom side is well cooked, gently turn to the other side. You will know its cooked on the bottom, when it turns to wheatish colour on the sides. Once you flip to the uncooked one down, press it well so that the place between the chunks gets cooked. Cover and sim for another 2 mins. When you are able to lift the dosa freely with the spatula, its ready. As we use raw ingredients, it takes a while to get cooked well. Each dosa took about app 3 to 4 mins. So don't have more than oen person waiting for the dosas! And make sure you alert them on the green chillies in the dosa. I had no issues as hubby loved munching on those green ones. Serve it hot as such. It should taste good, but I served it topped with Ghee and Podi. It tasted awesome. If Podi is not available, any pickle should do or even curds will go great with it. Athamma vouched that curds also tasted great with it. This goes to my Dosa Mela. Have you made a dosa yet? Ran out of ides, fear not! Check out Sra's for hot ideas!